Kenzi is pretty panicked about being buried alive (which I really don’t blame her for) and, thankfully, Dyson and Lauren dig her up and get her medical help. Some necessary snark follows before Kenzi tells them what happened to Bo. She has traded herself to a mystery person, probably her father, and was dumped in the lift and has now arrived on her floor – dimly lit stone tunnels with a fancy fountain and a rather out of place bouquet. It’s a maze. She walks through it chasing echoes and blurs – when one of those blurs cuts her leg; it’s a woman with pointy ears, teeth and claws and a skill for voice imitation (called Puca). Seeming to be on Bo’s side comes a bird that turns into another woman, lacking the pointy bits. Like any good guide, she is completely vague but talks about “defeating your doubts” and “Puca’s true voice” which is cryptic speak for “give Puca a kick” because that defeats the maze. That’s a pretty crappy maze you’ve got there. They’re in Tartarus, that hidden hell realm Trick mentioned, and Bo has déjà vu about it (probably because it’s just the Valhalla set with the lights turned off. 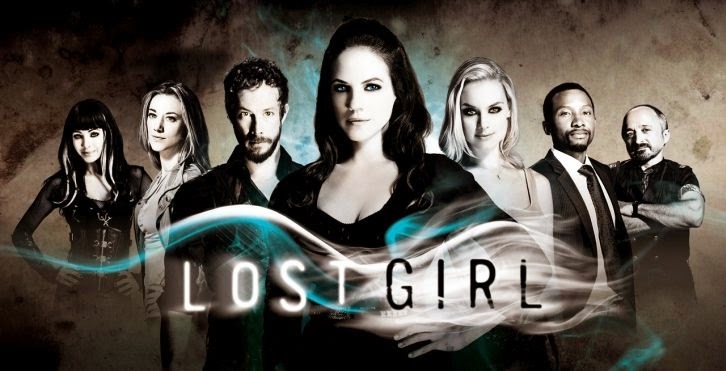 C’mon Lost Girl that’s just cheap). The woman warns Bo that Tartarus will look for a way to keep her but Bo wants to see daddy dearest. Perhaps confirming that, when Kenzi reunites with Trick at the Dal, he warns her that it could be any number of things, but gets her a spirit board anyway. Because Kenzi conjuring the spirit world won’t backfire at all. The stripping does convince Lauren that the ghost is Bo. In Tartarus, Bo learns her lover is Persephone of Greek Myth, Bo’s step mother. Which means Bo is the daughter of Hades. More importantly, it means she just got it on with her step-mother which is just icky except it’s pretty tame as far as the Hellenic gods go. Bo definitely wants to talk to daddy now, despite Persephone’s protests about what a bad man he is. Bo doesn’t exactly trust Persephone either. She enters her old nursery, remembering from a past vision. There she sees the cage where her mother was kept and Persephone explains the terrible way she was treated. Bo feels terrible for her mother especially as she learns that she sacrificed herself to free Bo and while she is sad, Persephone talks about Hades’s plan for Bo to be uber powerful and that his own power was weakening. Now Bo and Persephone are all bondy and happy, she tells Bo how to leave the underworld with a special candle and Bo heads to see dad. Which leads her to a huge black space where we can see nothing and Bo ranting at her father – telling him how little she needs to see him, how little he matters to her and if he does want to see her, it will be on her terms. After some dramatic threats, she leaves with the candle. She gets in the lift and an arm grabs her by the throat but Bo fights him off and the doors close. Once the lift is moving she collapses in a corner, crying. Dyson goes to the gates of Valhalla to try and keep them open – and Valkyrie Stacey arrives at the gates. Dyson threatens her, she’s not impressed so he flirts with her – which is much much much more impressive and she happily spills her mission; find a soul to replace Kenzi; someone close to Bo’s heart. Dyson pretends not to know Bo so he doesn’t get murdered and Stacey can go on drooling over him and bring him along on her soul hunting mission. She even leaves the gates open. Dyson takes Stacey to the Dal (and the fae are all happy with the deposing of Evony and the removal of the Una Mens) and he introduces her to Trick then has to convince her that Trick doesn’t care about Bo. Why bring her to the Dal of all places? He also has to hang up on a call from Lauren. He decides to throw Vex to the Valkyrie, basically giving Vex Dyson’s history. Before they can set up, Tamsin arrives to hiss at Stacey and tell Dyson about Bo’s dad. Dyson is briefly annoyed by Tamsin betraying Bo but is more concerned about kissing Tamsin’s sister. New plan, Dyson to the gates and Tamsin to follow Stacey. Back to Lauren and Kenzi who are holding a séance for Bo which involves black pudding. Because Kenzi. This ends up with a spirit board possessed with an angry spirit that probably isn’t Bo and Kenzi and Lauren cowering behind a sofa. Because. They manage to burn the spirit board in the fireplace. Trick is going to be miffed. .. Ok let’s just run with this. Valkyries have hair issues, Lost Girl has ceased to even pretend to be anything other than silly. Time for a group dinner because they’ve won. So it seems anyway. Bo refuses to talk about the Afterlife. But Kenzi and Dyson do talk about Hale. This is a clumsy segue to Kenzi saying she needs to step back away from the fae – because it cost her both the love of her life (Hale) and her own life; she has a second chance and she needs to spend it as a human, not a vulnerable extra among fae. She can do this because Hale left her land in Spain as part of his will. She and Bo have a surprisingly rapid but touching good bye and she leaves. Alone, Bo lights the candle for Persephone and somewhere else, in an office building, a woman holds that candle in a crowded lift – then the lights go out and we hear flesh tearing and screams. Am I the only one who thinks this show took an abrupt turn? Almost a retcon? For seasons now we have worried about the “Wanderer” and there were Valkyries related – basically everything was pointing towards Odin in particular and Norse mythology in general. Even following that through we ended up in Valhalla. But now Reiner was thrown in the path of all that world building, thrown away in the confused hot mess of the last season and now the Greeks have hurriedly hopped into the void? Why is Hades hiring Valkyries? It feels clumsy and kind of phoned in. I also am not really sold with Bo’s daddy issues – because we’ve gone from minor rumbling to full on raging issues somewhere along the line. And while I agree with Kenzi’s decisions and think it’s excellent to show people actually having the agency to say “I love you, but this is not a healthy situation for me”, it also felt abrupt. But it was a good scene and an important one – because loyalty shouldn’t completely overrule self-care and self-preservation. Kenzi is not on par with the fae around her, it’s a source of constant risk to her and there’s very little she can do to protect herself. But this also added to the sense that this episode had a lot of random stuff tacked on, especially at the end. I kept expecting the credits to roll and then something else would happen. Y’know I was all set to complain about, Stacey, Valkyrie, agent of Frejya, on a field mission to replace a soul in almost unprecedented circumstances being derailed by a hot guy. Then she stormed off in tears because of the hair comment so… yeah. Lost Girl.